This image was created near dusk at The Venetian Yacht Club on Long Island in Babylon, NY. The wedding day was a bride’s worst nightmare weather wise. Mother Nature provided rain showers all day long and put a damper on the bride’s plans to have her wedding photos made on the boardwalk overlooking the Atlantic Ocean in Long Beach on Nassau County’s south shore. Many bride’s ask me what we’re going to do if the weather doesn’t cooperate on their wedding day. I always assure them that an experienced wedding photographer is versatile enough to create amazing wedding pictures regardless of whether or not the weather is good or bad. We arrived at The Venetian and, after getting the bridal party some refreshments, moved into the main ballroom where their wedding reception would take place. The Venetian offers panoramic views of the Great South Bay and Robert Moses bridge from the wall of windows in the upstairs ballroom. I set up some wonderful, soft studio-style lighting and positioned the bride and groom in front of the windows. By balancing the artificial light with the natural light outdoors I was able to make all of the couple’s indoor photographs appear as if they had been taken outdoors overlooking the water. As dusk was approaching the showers let up for an ever so brief moment. 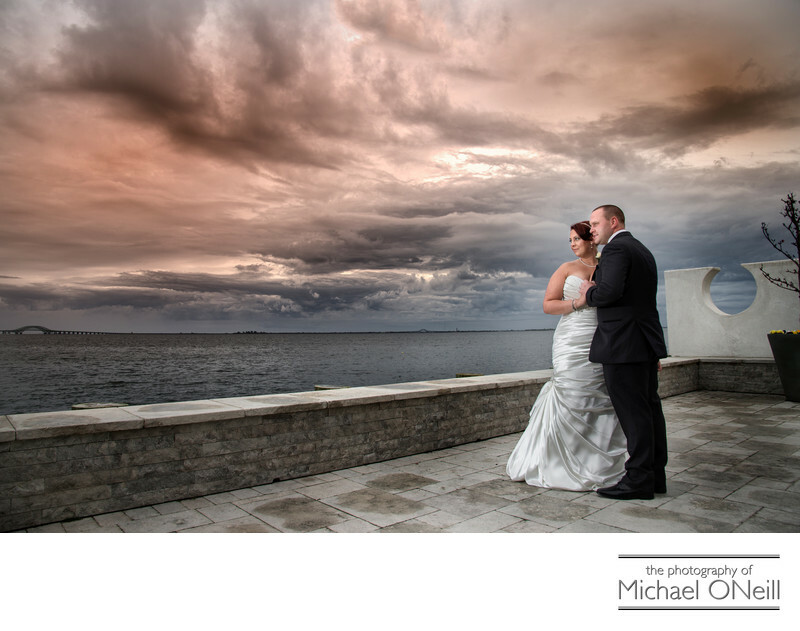 I quickly led the bride and groom to the waterfront deck and photographed them against this awesome backdrop of dramatic storm clouds.